Turmeric milk tea, also known as golden milk, is an age-old Ayurvedic healthy drink to boost your health, immunity and vitality. Turmeric when used with milk can be beneficial for various health problems such as common colds, sore throat, indigestion, diarrhea, irritable bowel syndrome, Crohn’s disease, menstrual cramps, headaches and arthritis. It is also known to relieve depression, detoxify the liver, purify blood, boosts circulation, speed up wound-healing, relieves pain, protects against cardiovascular disease and helps with neurological disorders. 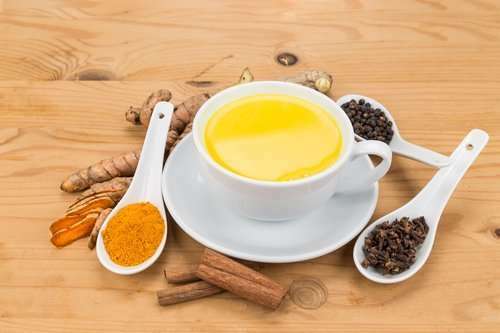 Turmeric Milk or Golden Milk is an ancient remedy. It’s an easy way to get the benefits of turmeric daily. It is usually taken at night because it helps relaxation and strengthen the immune system while sleeping. That’s why some people call it golden milk for sleep. Curcumin: Turmeric contains a key compound curcumin (up to 3% by weight), which has potent antioxidant, anti-inflammatory, analgesic and antiseptic properties. It helps to improve digestion of fats and sugars. Moreover, it helps ease inflammation in the digestive system. Black Pepper: Adding black pepper to golden milk further reinforces the health benefits of turmeric. Studies have found that black pepper contains piperine, a compound that helps the body to absorb curcumin better. Cinnamon: It helps regulate blood sugar, decrease bad cholesterol and improves circulation. Cardamom: It enhances digestion, helps detoxification and fights bad breath. Note: Adding spices like cinnamon and cardamom augments the taste and boosts health benefits of turmeric milk. (i) Milk: 1 glass, preferably low-fat milk. For vegan golden milk, you can use coconut milk or almond milk in place of milk. (iii) Black pepper: 1/4 teaspoon, powdered. If you are using freshly ground black pepper, you will need just a little less than ¼ teaspoon. (iv) Cinnamon: A small stick. Alternatively, you can use ½ teaspoon of cinnamon powder. (vi) Coconut oil: 1/2 teaspoon, virgin grade (optional). Including virgin coconut oil in turmeric golden milk improves its immune-boosting and cholesterol lowering benefits. (vii) Honey (organic): A little amount according to your taste (optional). (i) Pour a glass of milk into a pot, place it on a burner and turn on the heat. (ii) Add in ½ teaspoon of turmeric powder, ¼ teaspoon of powdered black pepper and a small cinnamon stick. (iii) Crush the seeds from a cardamom pod and add to the concoction. (iv) Add in ½ teaspoon of virgin coconut oil (optional). (v) Bring the concoction to a boil, then let it simmer for a few minutes. Strain and sweeten it with a little honey. Voila, your home made spiced golden milk is ready. Drink it daily at night before going to sleep. Tip: You can also add ½ or 1 teaspoon of grated ginger in your spiced turmeric milk. The golden paste benefits are same as that of golden milk benefits. (i) In a stainless steel pot heat water, turmeric and black pepper powder on medium heat for about 7 minutes until it forms a thick paste. Keep stirring while heating. (ii) Add in virgin coconut oil. Use a whisk to fully mix in the coconut oil (optional). If the mixture gets too dry, add a little more water. (iii) Take this mixture off the fire and allow it to cool before putting in a glass container with a lid and storing in fridge. (i) Take 1 teaspoon of golden paste and mix it with 2 cups of low fat milk in a stainless steel pot. Alternatively, you can use almond milk, coconut or soy milk. (ii) Gently heat the pot, but not to the boiling point. You can add in cinnamon, cardamom and organic honey according to your taste. Use whisk to mix well all the ingredients. A convenient way is to make a mixture of the spices and just add to warmed milk. (i) Mix well all the above ingredients and store in a cool, dry place. (ii) Simply, add 1 teaspoon of this mix to 1 cup of hot milk of your choice for a faster turmeric tea recipe. (i) If fresh turmeric root is available, you can grate 1-inch piece and use it instead of dry turmeric. Use a strainer to remove any remaining pulp or pieces. (ii) It’s an effective remedy for sore throat and cough. (iii) Pregnant women are advised to avoid taking turmeric milk. If you have any medical condition, consult your doctor before taking it. Golden Milk sounds really good!